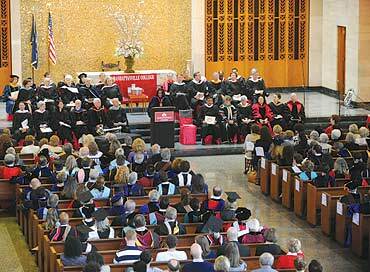 Dr Molly Easo Smith has been inaugurated as the 11th president of the Manhattanville College in Purchase, New York. She began her tenured presidency in July 2008, but the official inauguration was set for this month. She greeted the audience in Hindi, Tamil, Malayalam, Spanish and English. She cited the women who have influenced her, including her mother, grandmother and her mother's adoptive mother. She also honored three previous female Manhattanville presidents: Mother Burnett, Mother Dammann and Mother O'Byrne. "Molly Easo Smith is an American success story, the story of meteoric rise that could excite many immigrants for some time to come," said Professor A D Amar, Smith's former colleague at the Seton Hall University in New Jersey. "What happened to Smith can happen only in America; in about a decade, Molly rose from basically a faculty position in a small no-name college to the president of Manhanttanville College." India's Consul General in New York Prabhu Dayal, faculty chair David Adams and a host of leaders from various fields saluted the new president. A community reception and celebration followed the investiture ceremony. The South Indian dance troupe Ganapati Kautvum performed. Before her appointment at Manhattanville, Smith was the provost at Wheaton College in Norton, Massachusetts. From 2002 to 2006, she was the dean of the College of Arts and Sciences at Seton Hall University in South Orange, New Jersey. She held faculty appointments earlier in the English departments at several colleges and universities in the United States, as well as at the University of Aberdeen in Scotland. She earned undergraduate and graduate degrees at the University of Madras and a PhD in English at Auburn University. She also studied at the University of Delaware.